John Mason International are presenting the International Moving section of the National Australia Bank’s Emigration Seminar. 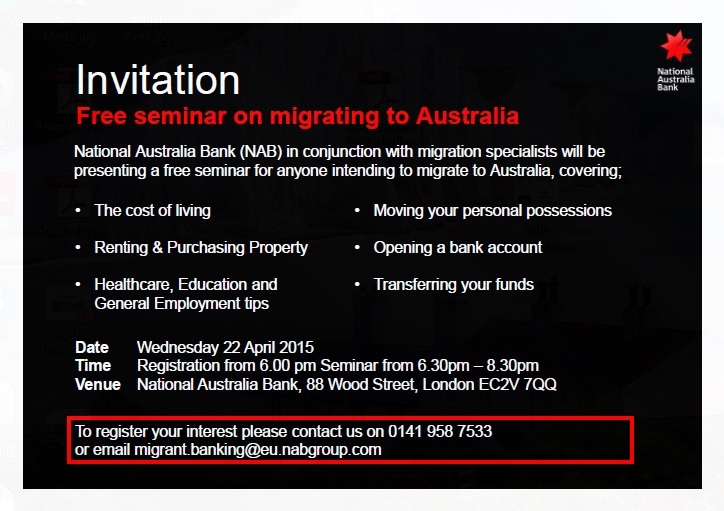 The free event is to be held on Wednesday 22nd April 2015 6.30pm – 8.30pm at National Australia Bank, 88 Wood Street, London EC2V 7QQ. Other topics covered in the seminar will be the cost of living in Australia, renting or purchasing a property in Australia, transferring funds overseas, healthcare, opening a bank account, education and employment tips.